Some vendors of spam filter software would have you believe that software to filter email spam is all the same. Nothing could be further from the truth. There is hardware-, software- and cloud-based spam email software, software to filter email spam that is only compatible with specific operating systems, plus spam filter software that manages devices individually rather than networks as a whole. There is a big difference between spam filter software aimed at consumers and spam email software for business. Even within the business sector, there is a wide range of features that can enhance spam detection rates; and, of course, there is price. You will see a wide range of prices for software to filter email spam. Believe us when we say that biggest is not always the best! The place to start with spam filer software is to look at how many spam emails your employees are receiving each day out of the total number of non-domain emails they receive (i.e. excluding internal emails). Research conducted by the Radicati Group in 2016 suggested the average was 14 spam emails from a total of 90 non-domain emails per day. From our own research, these figures imply the average spam filter software has a spam detection rate of around 97%. 97% may look like a pretty impressive number, but due to the increasing sophistication of cybercriminals, the 3% of spam emails that avoid detection will likely be those that are the hardest to spot by employees and that will be carrying the most dangerous payloads. Therefore, irrespective of how many spam emails your employees are receiving each day, you will want to reduce that number to an absolute minimum. To hope for 100% spam detection is unrealistic. The likelihood is that too many genuine emails will be quarantined in error (what we call “false positives”). But how about 99.97%? A spam detection rate that high would significantly reduce the volume of spam email your business receives and minimize its exposure to email-borne threats. The average spam filter software achieves spam detection rates of around 97% mostly by comparing incoming emails against blacklists of known sources of spam and IP addresses from which reported phishing attacks are known to have originated. This is a pretty useful way of blocking access to most web-borne threats, but what about the most dangerous 3% of spam emails? In order to filter email spam 99.97% of the time, spam filter software uses a process known as greylisting. The greylisting process returns every incoming email to the server from which it was sent, asking for it to be resent. The reason why this process is so successful is that spammers´ mail servers are often too busy to reply to the request and the spam email is never returned. By using the greylisting process, spam filter software blocks spam emails from previously unknown sources of spam as well as previously reported sources of spam. Admittedly the process can delay the delivery of business-critical emails by up to five minutes while the spam email software is waiting for greylisted emails to be returned, but there are ways trusted accounts can bypass this process. What few vendors of spam filter software tell you is it can be equally as important to filter your outbound mail as it is to filter your inbound mail. The reason for this is that, if your IP address is identified as a source of spam, it can be blacklisted – not only affecting communications into and out of your business, but also potentially affecting public access to your website. Unlikely? Think again. One of the main goals of a phishing email is to obtain login credentials. If a spammer was to take control of a corporate email account, they could use it to distribute malware-laden spam to all your business´s contacts. The consequences could be more devastating to your business than if you were to suffer a malware attack yourself. In addition to likely being blacklisted, your reputation would be damaged. Scenarios such as these can happen inadvertently as well as maliciously. Say, for example, an employee connected his or her mobile device to your business´s WiFi network and uploaded a file they had prepared on their malware-infested home computer before sending it to a client. Outbound filtering and scanning with antivirus software prevents these scenarios from occurring. SpamTitan has been developed by a leading online security group with almost two decades of experience in the industry. Available as a software or cloud-based solution, SpamTitan is universally compatible with every operating system, infinitely scalable, and administered via a centralized, web-based management portal. All software updates are conducted in the cloud, making SpamTitan the ultimate low-maintenance software to filter email spam. Our anti spam software has all the default mechanisms you would expect to find in an “average” email filtering solution, plus greylisting, optional HELO tests, Sender Policy Frameworks and LDAP-compatible recipient verification tools for the fast application of acceptable spam thresholds by individual, by group or by domain. All of the additional mechanisms to filter email spam 99.97% of the time are easy to apply and adjust with the click of a mouse via the management portal. Naturally, our spam email software includes outbound scanning and has a full suite of reports administrators can order to review historic activity and identify threats from within the network. Support is provided twenty-four hours a day and included in the price. The price is determined by the number of mailboxes you wish to protect, your preferred deployment option and payment cycle, and typically works out at less than $10.00 per mailbox per year. If you have any questions about our spam filter software, do not hesitate to contact us. 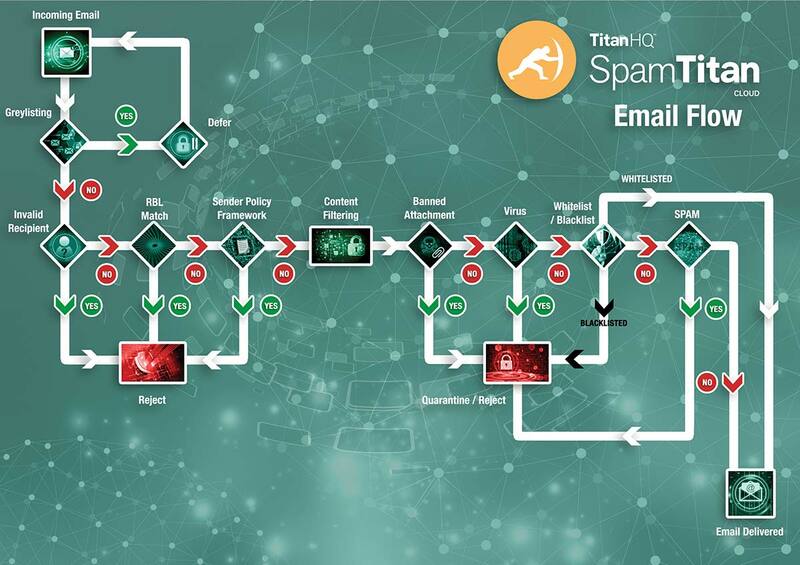 Our team of Sales Technicians will be happy to answer your questions, discuss your email filtering requirements and invite you to take advantage of a free trial of SpamTitan. There are no contracts to sign, no credit cards required, and no obligation for you to continue using our service once the free trial has finished. Contact us today to find out more.